If you're bringing home a new German Shepherd puppy, it takes a lot of planning and plenty of puppy proofing. Before you jump head first into this big decision (please never bring home a puppy or dog on impulse) you must first evaluate your needs- your real ability to care for a dog, your household space issues, the financial ability to afford and adequately care for a dog, and the sincere readiness of ALL family members to welcome a new member into the family. Depending on which German Shepherd puppy you choose, you're easily going to share your life with this new addition for 12 years or more. And depending on which GSD puppy you choose and how well you socialize and train your new puppy, that time spent with your German Shepherd puppy can be great or terrible or anywhere in between. 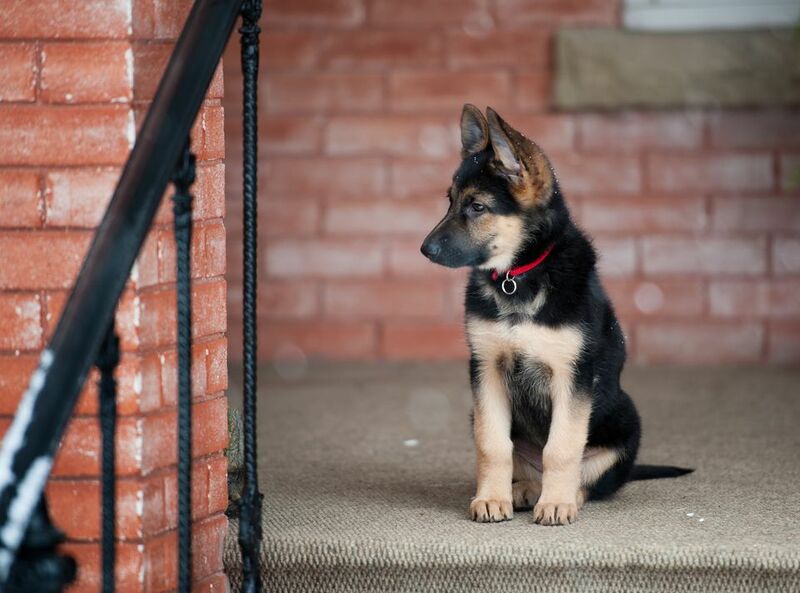 What do you look for in your potential new GSD puppy? Most breeders and German Shepherd enthusiasts will agree that temperament is key. This is important because it makes your German Shepherd more compatible in any situation, with better coping skills no matter what you throw at it. Soundness in temperament is key, no matter what the future purpose of the puppy may be - working, herding, companion, etc. Now, a major question: where can a prospective buyer find the perfect German Shepherd puppy of their dreams? There is more than one answer to this question. Obviously, the first thing you'll think of is from a breeder. This is by far the best way to get a German Shepherd other than through a GSD Rescue Service or at your local animal shelter. If you decide to go through a breeder, just remember, not from just any GSD breeder. If you do decide to do this, just make sure the breeder you choose your next companion from is reputable. Just what makes a breeder reputable you might ask? First off, I would start on the internet. Check out the German Shepherd Dog parent breed club (gsdca.org), and then do further serious research with local german shepherd breed clubs in your area. This is a great way to get several names of breeders. Another good way is to get referrals from local vets, any dog groomers in your area, or other German Shepherd Dog owners that you know of. Please do all your research carefully and check out all recommendations and references seriously. Be cautious and ask a lot of questions. A good breeder will expect that from you and will ask you many questions as well before you get an opportunity to take their precious puppy home. If any German Shepherd "breeder" is willing to offer you a "deal," does not have a clean kennel, or acts suspiciously to you in any way, back out quickly. Trust your instincts. Look for a GSD breeder who is truly interested in her breed and much more interested in finding a proper home for her puppies than simply getting paid. Any breeder who is simply in it for the money has the wrong motivation altogether. Take the time to talk with the breeder more than once via the phone, email, etc. and visit the German Shepherd litter more than once if possible before making your decision. Also, does the breeder offer a guarantee? What type? What kind of documentation do you get with the German Shepherd puppy? What about the registration papers? Pedigree? What other things go home with the new puppy? Food? Collar? Other paperwork? Did you get to meet the parents of the puppies and the littermates? Did you get a chance to have hands-on time with them? A reputable German Shepherd breeder will offer all of this and more. Don't expect any less. Additionally, ask the German Shepherd puppy breeder about shots, dewormings, and exams the puppy may have already have had. Are the GSD puppy's parents "OFA certified?" AKC Registered? Ask to see certification of both parents from one of these organizations; reputable GSD breeders will usually offer the information without asking. And, take a very close look at the pup. It should be a proper weight (not too chubby or too thin), clean, odor-free and kept in clean surroundings; clear eyes, not runny or red; clean ears; full hair coat (no balding spots), no excessive scratching; and appear well-socialized, playful and friendly. Take the puppy to your vet for a complete exam with 48 hours of purchase. Where Should I Get My New Dog? What Age Dog Should I Adopt?